Ex-Chelsea boss Carlo Ancelotti says he wants to return to the Premier League, but will not be back this season. The 56-year-old Italian, who won the Premier League and FA Cup in 2010, has been mooted as a possible successor to Manchester City boss Manuel Pellegrini. But he has ruled out a return in 2014-15, quashing rumours he could soon replace Chelsea boss Jose Mourinho. 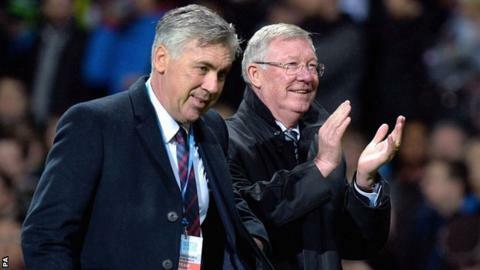 Speaking on BBC Radio 5 live's Sportsweek, Ancelotti said the Premier League was his "number one choice". The former Paris St-Germain and Real Madrid manager added: "I had a fantastic experience in France and Spain. Ancelotti is taking a break from football and living in Vancouver following his dismissal by Real in May 2015, a year after winning the Champions League. Are Chelsea 'specialists in losing'? Ancelotti managed Chelsea from 2009 to 2011, and was sacked a year after winning the Double. He backed Blues owner Roman Abramovich's decision to retain Mourinho, despite the champions winning only three of their 12 league games so far this season. Ancelotti, who has won the Champions League three times as a manager, said: "Chelsea are used to competing at the top level. They have lost a little bit of confidence in their play and arrived at bad results. Slowly they can move on from this situation. "Mourinho is the best person to manage this because he is the one involved, he knows the situation and the condition of the players and the club took the right decision to stay with Mourinho."